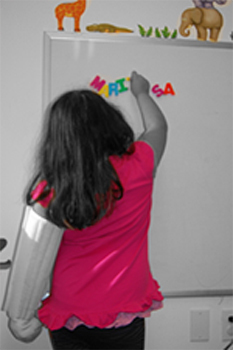 Constraint therapy aims to improve the hand and arm use of children with hemiplegia. It involves restricting of the uninvolved or less affected arm to increase the use of the more involved or affected arm. The “good” arm is placed in a soft cast or wrap for the period of time of the constraint. This is done typically two times per day for 1-2 hours each. During the time the constraint is on, you will be asked to engage your child in specific activities to help increase the motion and function of his/her more involved arm. This type of therapy has been proven successful in children with hemiplegia if activity accompanies the constraint and the program is followed accurately. Constraint therapy is also sometimes referred to as constraint induced movement therapy (CIMT) and constraint-induced therapy (CIT) in the literature. When constraint therapy is been paired with bimanual activity training (using two hands together) patients achieve the most benefical effects. No, it is typically custom fit for your child so that it is comfortable to wear. How long will this type of therapy be needed? Typically CIMT is done in intensive blocks- typically 8-10 weeks. It may be repeated 1-3 times during a year, but it is not a continuous forever type of therapy. What if my child resists the constraint? By providing 1:1 support, fun activities and reinforcers (i.e. prizes) most children become accustomed to the routine quickly. Can my child play outside i.e. on the playground or during sports with the constraint in place? NO!! The constraint is meant for quieter, tabletop activity. Your therapist will provide a list of appropriate activities for your child at each visit. Will I still come in for my regular OT and PT visits? YES! In fact, we may ask that you increase the intensity of the therapy during the CIMT period to at least 2 X per week. This will allow your therapists to also maximize the CIMT benefit during treatment. Will my child still use his/her E-stim unit while the constraint is on? Yes! This will help to increase the forced use of the involved hand and arm.